Solve for Happy by Mo Gawdat is a Google [X] Chief Business Officer's perspective and formula for bringing more happiness into your life. The book begins with Mo talking about his struggles around coming to terms with the early accidental death of his teenaged son, Ali. The majority of the book is centred around his Happiness Model of 6 – 7- 5, which is a shorthand way to explain the concepts he has brought together from a number of different sources. It has a cognitive behavioural therapy feel about it. It's about busting the 6 grand illusions, fixing the 7 blind spots and 'hang on' to the 5 ultimate truths. 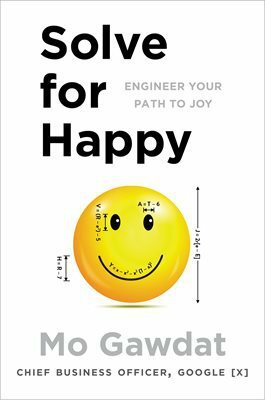 Solve for Happy is an original take on the happiness self-help genre, from an engineer with a fondness for thoroughly analysing a problem. Solve for Happy is available in paperback from your favourite bookseller. Mo Gawdat is a serial entrepreneur and Google Vice President whose personal story has taught him more about life and what really matters than all the board meetings and business deals. This looks like a very interesting book. Amazon.com.has it at much lower than the RRP especially the Kindle version. I've read the preview and bought it. Thanks for sharing Emma.